It appears that the sun has finally arrived after what feels like a lifetime of hibernation and so it felt quite fitting to share the latest trends on how to prepare our homes for the summer. 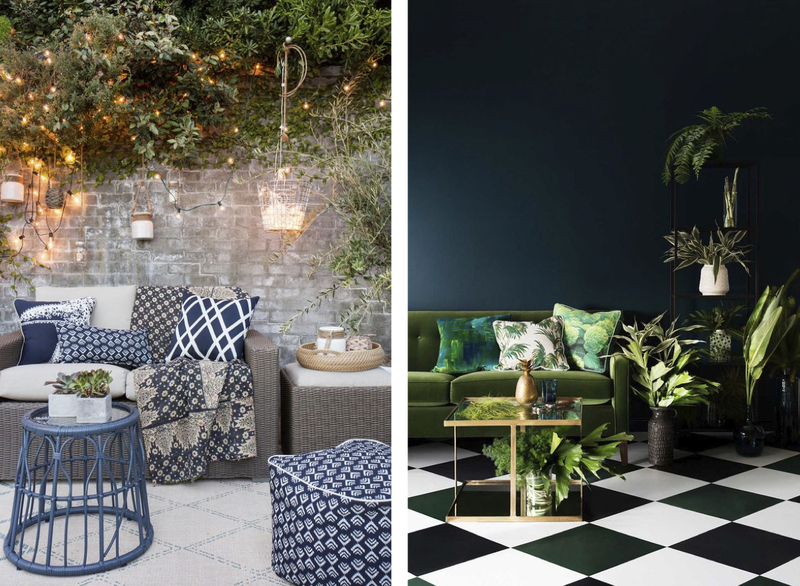 Desperate to give our living space the seasonal update it truly deserves, the fast increasing Inside-Outside interiors trend would be the perfect way to refresh our homes and offer us even more space to relax in throughout the summer period. Sunshine and blue skies are not often the representation of our days and so with complete British tradition, we bring out the shorts and the BBQ’s the second we spot even a little bit of sun. By being clever with our Interior Design, we can create smart indoor style outside spaces and with simple tricks, bring the crisp outdoor sense inside. Whether you have an extensive garden, a cozy balcony or anything in-between, you can create an outdoor room using exactly the same process you would to create an indoor one. The first thing to consider is how you actually want use the space. Does it need to be a living area? An eating area? Or perhaps a little bit of both? 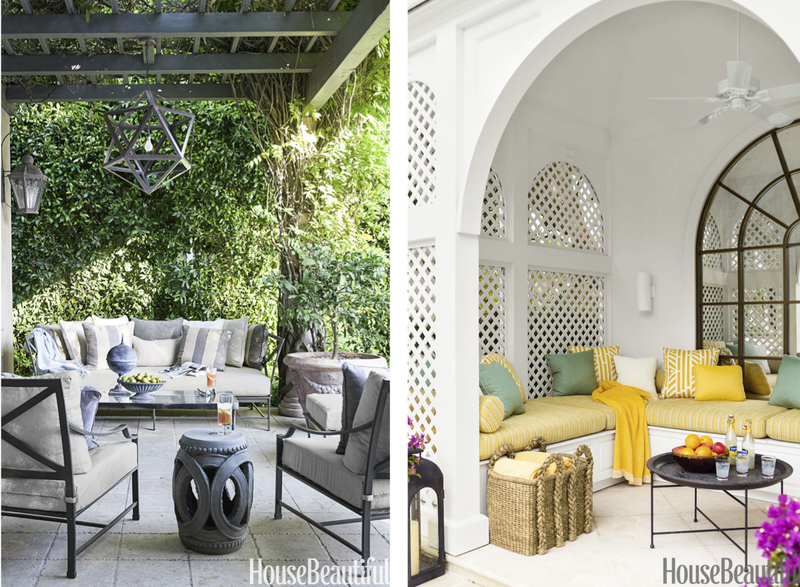 The layout of your outdoor room can mimic the living room you have inside. There are numerous comfortable rattan sofas and armchairs that can create cozy seating spaces for all the family. I can hear you saying, “we have a tiny balcony and have no space to store extra cushions” – don’t worry! There are plenty of brands that do outdoor furniture with cushions that can stay on all year round so there is no need to store them inside. No matter what the function, comfort is key and so don’t forget to accessorise with lots of scatter cushions in waterproof ‘yacht standard’ fabrics. Many companies are now offering an outdoor version of their most popular lights and along with an outdoor rug, lanterns and greenery; the space will be sure to extend your living room. Concrete dining tables with a wood effect top would suit the more contemporary garden and Kartell have brilliantly comfortable dining chairs that can stay outside all year round. To help bring the outdoors inside when the typical British summer returns, accessorise your sofas with leaf patterned or emerald green velvet cushions. Complement this with mint green vases full of foliage or pots filled with oversized plants to help keep the inside of your house looking garden fresh. Perhaps there is a piece of artwork on your walls that you have been meaning to replace for a long time. 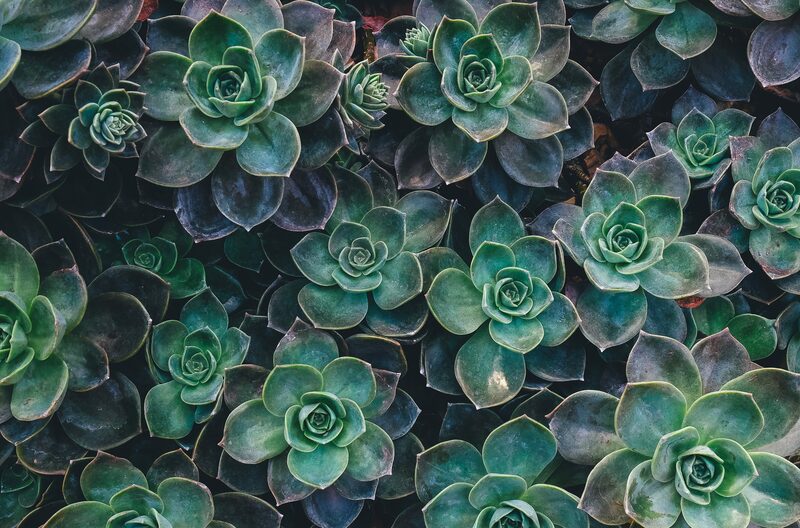 How about a Living Wall to take its place for the summer? The Living Wall has been the latest craze for smaller city apartments that have either a small balcony or no outside space at all, as it is the perfect way of bringing the garden inside. For the expert gardener, hang pots of succulents from a set of built in shelves or train climbing plants to go up a wire trellis. For those who have never heard of a watering can, try custom-made irrigation systems that can be purchased by the square metre. Making our space more usable, no matter what the weather throughout this upcoming season, we will feel as though we haven’t been cheated of our summer holiday.